How Do I Tell Which Program Is Using So Much Memory? - Ask Leo! How Do I Tell Which Program Is Using So Much Memory? When Windows tells you it's out of memory, what does it mean, and what can you do about it? Occasionally, Windows will report that it is running low on, or completely out of, memory. When that happens, programs may start to misbehave, fail, or crash completely. Of course, one of those failing programs could be Windows itself. 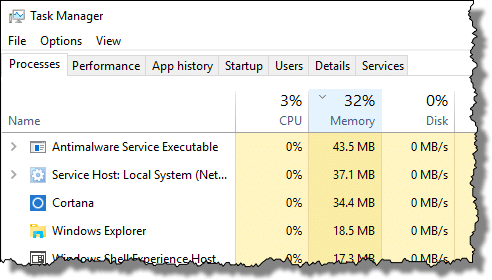 Recent versions of Windows have made it a little easier to determine which programs might be consuming more memory than is warranted, leading to the dreaded “out of memory”. When we talk about “memory”, we’re referring to your computer’s RAM. That’s the memory that is erased every time you turn off your computer. That’s different than disk space, which some people erroneously refer to as “memory”. While your hard disk does remember things, even when the computer is turned off, it’s not referred to as memory. However, when it comes to computers, life is never simple. It is possible to use disk space as a kind of “fake” memory, referred to as “virtual memory“. While there are obscure scenarios in which running out of disk space can result in low memory conditions, here I want to focus on how Windows manages (and runs out of) RAM, not disk space. Note: this is primarily about Task Manager available in Windows 8 and later versions. For prior versions, see the section “More details and older versions” below. 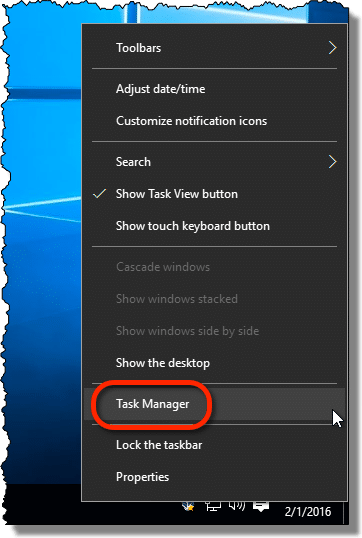 Right-click on the clock in your Windows taskbar, and click on Task Manager. This will bring up the Windows Task Manager application. If it’s not selected by default, click on the “Processes” tab on the left. One of the columns displays “Memory”, and as you might expect, we’ll be interested in its contents. Click on the word “Memory” in the column header. This will sort the display by memory usage. In my example, something called “Antimalware Service Executable” is currently using the most memory in my system. What you see will naturally be different, depending on what software is currently running on your computer. In addition, the numbers and the order can change as you watch. Task Manager updates the process display approximately once a second. If the line item has a small caret – > – to its left, click on that for a little more information. My “Antimalware Service Executable” turns out to be the program that runs Windows Defender. For an alternate, sometimes slightly more informative view on the programs running on your machine, click on the Details tab. Rather than being listed by the name of the application, this display includes all of the running programs by its executable (“.exe”) name (the file that provides the application, or, in some cases, parts of the application). Like the previous tab, you can click on the “Memory” column header to sort by the highest amount of memory used by the program. In my case, that’s “MsMpEng.exe”, which is the “Antimalware Service Executable”, which, as we saw earlier, is Windows Defender. This Details tab can be useful to look at in addition to the Processes tab, as it can give you more granular information about exactly what program is using memory. Together, they can give you a very clear indicator of exactly which program is at fault. Running low (or out) of memory can happen for so many different reasons it’s impossible to have a simple answer for what to do when it happens. Using Task Manager, above, you can at least start by identifying which program is using too much RAM; it’ll most likely be the one that stands out as using the highest percentage, sorted to the top on the Processes tab. It may be that you’re simply try to do more than you can with that program for the amount of RAM installed on your system, or virtual memory configured. You can try to increase the virtual memory size, but I’ll warn you: the more virtual memory you end up using, the slower the program, and your entire computer, are likely to become. If one specific program causes the problem repeatedly, it’s also very possible that it has a bug. What’s called a “memory leak” happens when a program loses track of how much memory it is using, and keeps using more and more and more as a result, even though it shouldn’t need to. Make sure you’re running the latest version of any programs you find at the top of the memory-usage list. But the bottom line here, really, is that while we can typically identify which program might be using excessive amounts of memory, that’s simply the starting point for your research to figure out why, and what – if anything – can be done about it. In the past, I’ve also recommended using a program called Process Explorer, a free download from Microsoft, to do the research above. 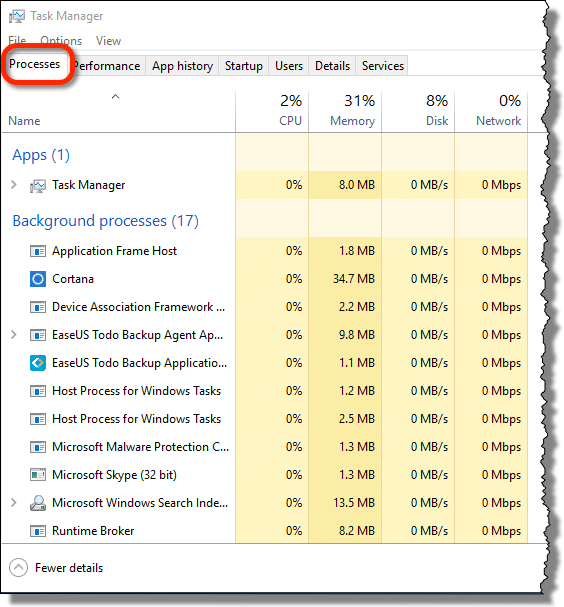 Recent versions of Windows’ own Task Manager have made that less necessary, as it now contains many features that were previously available only in Process Explorer. However, Process Explorer is still a powerful, albeit geeky, tool. 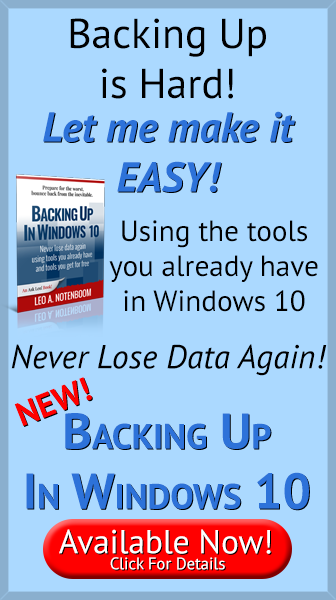 If you want to dive into things in a little more detail, are comfortable with or looking for even more information about your running processes, or you have Windows 7 or earlier, Process Explorer would be the tool to use. How do I find out who’s using all my memory? is an older article that covers using it. How Do I Find Out Who’s Using All My Memory? - When your system starts to slow down, programs using excessive memory are frequent culprits. It's fairly easy to find out which programs they are. How can I find out what program keeps popping up in my taskbar and disappearing before I can click on it? - It's not uncommon to see programs quickly come and go. There are a few ways to try and capture what they are; some technical, and some innovative. What program is displaying this window? - Use Process Explorer to identify windows or message boxes that appear without any obvious indicator of what program they're from. How Do I Find Out What Program Is Using All My CPU? - Occasionally, one program uses up all of your computer's processing resources. Using Task Manager, it's easy to figure out which program that is. “You can try to increase the virtual memory size…” – I don’t I’ve ever encountered a situation in which altering the default setting of the paging file – or relocating it – has been of benefit and think it’s probably best to simply let Windows manage it. If more memory is needed, it’s better to add RAM than tinker with the paging file. Think of the library building as a hard disk. The buiilding may be huge like a warehouse or small like a shop – but it’s empty until you actually put books in it. Think of your programs and data files as the reference books or essays and dissertations which would be stored in the library. If you have a lot of such books, your library building will need to be large (like a warehouse) rather than small (like the shop) to hold them all. Think of RAM as the library tickets. If you have only two library tickets, you may only get 2 books out to have open on your desk at any one time (analagous to only having a small amount of RAM). You could have a vast warehouse with all those books stored in them but if you can only have two at a time, rather than reading from a reference instruction book or writing an essay into an exercise book, you are going to have an awful lot of getting up and down going back and froth through security between the study area and the book repository itself if you only have 2 tickets! If you have 8 tickets or better 20 tickets then you can have multiple reading books and multiple notebooks open on your desk in the study area at any one time saving you having to spend a lot of time going back and forth to and from the book storage area in the warehouse. So to recap. The hard disk is like the physical building; the programs and other files you have are like the content of the building (a big building doesn’t mean it has anything in it) and the RAM is the amount of items you can get on the desk you site at when your read fromor write into what you actually keep stored in the building itself. Good article, but much more useful to let us know WHAT to turn off. There’s no simple answer. It’s different for everyone and every computer. Besides Windows own Task Manager, I’ve been using TaskInfo by IARSN Software for a long time. It’s like Task Manager on steroids! If you wish, you can download the program and “test drive” it. I have no stake in saying this except that I really like it, and I’m probably only using a small part of its full panoply of features. That’s my. $.02. Paul Faulkner – I find using the analogy of a kitchen seems to work well too. The program and data files are the food which is stored in the refrigerator (the hard drive). Of course, you can’t work with the food while it’s in the refrigerator so you have to take it out and place it on the worktop/counter (the RAM). The bigger your worktop/counter is, the more food you can work with at one time. If you only have a small worktop/counter, you can only work on a small amount of food and have to keep taking that back to the refrigerator while you get something else out to work with. Good analogy. Now I’m hungry.